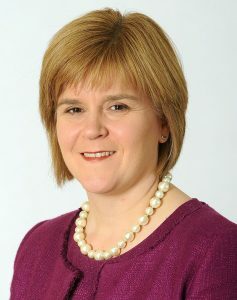 Below is the text of the speech made by Nicola Sturgeon, the Scottish First Minister and Leader of the SNP, at the party’s conference in Glasgow on 10 October 2017. Leading this Party is a great privilege – one enjoyed by just a few people in our history. Earlier this year we lost one of our past leaders – a true giant of our movement. Gordon Wilson had the good fortune to be born in Govan in this city. And to represent Dundee in the House of Commons. When Gordon became leader of our party in 1979, he was one of just two SNP MPs at Westminster. Hopes of a new Scottish Parliament had just been scuppered. But Gordon’s commitment and political skill laid the groundwork for the SNP’s future success. New members and younger voters may not know of Gordon’s contribution, but it can’t be overstated. He kept the flame alive. He devoted his life to serving Scotland. And all of us owe him a deep debt of gratitude. The three years I have been your leader can be described in many ways. Dull isn’t one of them. We’ve had an EU referendum. And not one, but two, Westminster campaigns. Different election contests, for different Parliaments. But with one common thread. Victory for the SNP in all of them. Of course, we’ve had tough days along the way – and we learn from them. In June we lost good colleagues from the House of Commons. Let us thank them for their service. But let me offer a gentle reality check to our opponents. The SNP is polling at a higher level today than we were at this point in the honeymoon days after our 2007 win or our landslide in 2011. Our lead over the second placed party now is twice what it was in October 2008 – and it is five times that of 2012. Ten years into government, the verdict of the Scottish people is clearer than ever. They trust the SNP to deliver for Scotland. And we will work each and every day to retain that confidence. That applies here in this great city too. For decades, Glasgow has been run by Labour. In May, that came to an end. The cronies and time-servers are out. Fresh ideas, Susan Aitken and the SNP are in. The difference is already clear. Under Labour, a bitter school janitor dispute rumbled on for months. Within weeks, it was resolved by the SNP. For years, under Labour, women were denied the equal pay they are entitled to. It may take us a bit of time to fix Labour’s mess, but I make this promise today. The injustice suffered by low paid women in this city will be put right. Equal pay for equal work, denied for too long, will be delivered by the SNP. As we fight for Scotland, our opponents fight each other. Scottish Labour is currently having its annual leadership election. Hypocrites, plotters, betrayers, barrel scrapers. No, that’s not what we’ve been calling the candidates. That’s what they’ve been calling each other. These days, ferrets in a sack distance themselves from Scottish Labour. And as for the Tories – well, they’re now back in third place in Scottish politics. They are a policy vacuum. And the racism, misogyny and sectarianism within their ranks has been on full, ugly display. The disgusting views that have been expressed by too many Tory politicians have no place in public life. It’s time Ruth Davidson found some backbone and kicked the racists and bigots out of her party. The opposition in Scotland are all over the place. That’s why more than ever the responsibility is on us, the SNP, to provide the good government that the people of our country expect and deserve. It is up to us to inspire the optimism that will drive Scotland forward. Just as we have over the past decade. Our record is a strong one. More than £3 billion extra for the NHS. Almost 12,000 more health service staff. And the best performing emergency departments anywhere in the UK. And no privatisation of healthcare. As long as the SNP is in office, the NHS will always be in public hands. Now we are focussed on vital reforms to shift more care and more resources into communities. Tough decisions, yes – but necessary to make our NHS fit for the future. As in health, so too in education. In our schools, higher passes are up by almost a third. Ten years ago, just 12% of young people in this city left school with 3 Highers. Today, it is 30% and rising. Now we are reforming school education – empowering headteachers and delivering more money direct to the classroom. I said we would close the attainment gap in our schools – and, mark my words, that is exactly what we are going to do. We have rebuilt the country’s infrastructure too. From Lerwick harbour in the north. To the Border Railway in the south. From the Queen Elizabeth Hospital in the west. To the magnificent new Queensferry Crossing in the east. And what an amazing feat of Scottish engineering that is. Look and travel across our wonderful country – the evidence is all around us. Superfast broadband being extended to 100% of premises. We are connecting Scotland for the 21st century and beyond. The SNP is Scotland’s Party and we are delivering for all of Scotland. This progress is good for Scotland. And it has another benefit. It shows the way for the rest of the UK. Last week, Theresa May said she would freeze tuition fees in England. She said they won’t rise above £9,250. Well, I can announce today that we will match that commitment. We will also freeze tuition fees. But we will freeze them at zero. Politicians elsewhere in the UK argue about whether fees should be frozen, reduced or abolished altogether. We abolished tuition fees. We restored education as a right. And we now have record numbers of young people going to University. While others debate fees, we are focused on the next challenges. Reforming student support. Widening access. To give young people from poorer backgrounds – not just a better chance of going to university – but an equal chance of going to university. On housing too – one of the biggest issues of our time – while Westminster dithers and delays, Scotland is leading the way. When we came into office, council house building in Scotland had ground to a halt. The last Labour government built 6 council houses. Not 6000 or 600 or even 60. So 8 years ago, we started a new generation of council house building. And since then, we’ve built 8,500 council houses. Overall, we are building new social housing at a faster rate than any other part of the UK. And now we are going further. Over this Parliament, we will deliver 50,000 more affordable homes. We are backing our commitment with record investment. £3 billion in this Parliament – almost 80% more than in the last five years. We’ve already set out how much money councils will be allocated each year. And we will not allow any of it to be diverted to other priorities. Let me make this clear to every council today. If you don’t use all of your allocation to deliver new housing, we will take back the balance and give it to one that can. On money for housing – if you don’t use it, you will lose it. Every last penny of our investment will go to delivering the new houses that people across this country need. Over the past ten years, we have led the way. We should be proud of what we achieved. Our focus now is on the next ten years and beyond. The world we live in today is changing at a faster pace than we have ever known. The challenges we face are generational. Our responses must be transformational. Last month we unveiled our programme for government. A new programme for a new Scotland. It offers practical solutions to the daily concerns people have. And it aims to equip our country to prosper in a fast changing world. As we look ahead we face a choice. We can trail in the wake of the change that is coming. Or we can choose to shape our own future. We will not wait for others to decide for us. Let’s resolve to put Scotland in the driving seat. A country which values education and cares for future generations will always be in the driving seat. At the heart of all we do is a determination to make Scotland the best place in the world to grow up. I’ve referred already to our school reforms. But it is what we do in the early years that matters most to the life chances of children. The baby box really is a beautiful thing. Not just for all the practical help it provides Or even the contact it promotes between pregnant mothers and midwives. It is beautiful because of what it says. All children are born equal. All children are valued. All children deserve the same start in life. But much as I love it, the baby box is not the most significant of our early years policies. Our expansion of nursery education is. Currently, we deliver around 16 hours of early education and childcare a week – that’s already an expansion. But it means some parents still face a struggle to find and fund the childcare they need to allow them to work. By 2020, we will deliver 30 hours a week for every three and four year old and eligible two year old. It will give children the best start in life. It will free parents to find work. And each month it will save families around £350 on the costs of childcare. That is the kind of real, practical help that young parents need. Often when I talk about this policy, I’m asked – sometimes sceptically – if we will really be able to fund it properly. Well, today, we put our money where our mouth is. Over the past few months, we have undertaken detailed work to assess the investment needed. Right now, we invest around £420 million a year. I can announce today that by the end of this Parliament, that will double to £840 million a year. That is a commitment unmatched anywhere else in the UK. And it is the best investment we can make in Scotland’s future. That includes those who grow up in care. Last year, I set out plans for a fundamental review of the care system. We want it to have love at its heart. We are also delivering practical help to level the playing field for care leavers – like full grants and guaranteed places for those with the grades to go to university. We want to make life a little bit easier for those leaving care. So I can announce today a further step. We will change the law so that all young care leavers are exempt from paying council tax. We can do all these things because we are in government. We can make a difference every day – with decisions that benefit this and future generations. The greatest responsibility of all that we owe to the next generation is to protect the planet. In 2009, we passed world leading climate change targets and we met them. Next year, we will go further. A new climate change bill will set even more ambitious targets. We will meet our obligations under the Paris Accord. Every industrialised country, large or small, must play its part to meet our collective duty to safeguard the environment. And let me be blunt about this. That applies just as much to the White House as it does to Bute House. Environmental campaigners recently described our programme for government as the greenest in the entire lifetime of the Scottish Parliament. In that programme, we committed to setting up Low Emissions Zones in our four biggest cities by 2020, to improve the quality of the air that we breathe. The first of these will be in place by the end of next year and I am very pleased to announce today that it will be located here in the city of Glasgow. We should also be proud of how we handle the difficult decisions involved in tackling climate change. We don’t rush to judgment. We weigh up the evidence. We listen to the people. And we come to clear conclusions. Fracking is now banned in Scotland. Tackling climate change is a moral obligation. It is often seen as a challenge. But it is also a massive opportunity. Scotland can be a world leader in the technologies that will drive forward the low carbon economy of the future. Jobs and investment are there to be won. So we are leading by example. We will end the need for new petrol and diesel vehicles by 2032 – 8 years ahead of the rest of the UK. An ambitious target, but one we know can be met. In 2007, we pledged that by 2020, 50% of the electricity we consume would come from renewable sources. Last year, ahead of schedule, we achieved 54%. That’s great for our environment. And the lesson for our economy is this – by leading the way in using new technology, we send a message to the world that Scotland is the best place to develop it. Already, we are home to the largest tidal power array in the world. And next week, we will celebrate a new global first. I will officially open the world’s largest floating windfarm, situated right here in Scotland, off the coast at Peterhead. To put ourselves in the driving seat of change. That is why we are establishing a new National Manufacturing Institute and increasing our investment in business research and development. And it is why we have made this decision too. At our conference in March, you asked us to set up a Scottish National Investment Bank. And in our Programme for Government we committed to doing just that. The Investment Bank is about doing things differently for the new age. In our manifesto last year, we also pledged to explore the option of a new publicly owned energy company. The idea, at its heart, is simple. Energy would be bought wholesale or generated here in Scotland – renewable, of course – and sold to customers as close to cost price as possible. No shareholders to worry about. No corporate bonuses to consider. We will set out more detail when we publish our new Energy Strategy. But I am delighted to announce today that – by the end of this Parliament – we will set up a publicly owned, not for profit energy company. We are taking real action in government now to meet the challenges of tomorrow. Responsible intervention to advance the collective good. We are also taking steps to empower communities. Local ownership. More autonomy for our islands. And of course land reform. Exactly 20 years ago, the people of Eigg bought their island from its owner. And so started Scotland’s modern journey of land reform. In recent months Ulva, an island off the west coast of Mull, has sought permission to follow in Eigg’s footsteps. If permission is granted, the residents can get on with raising the money needed. The Scottish Government has carefully considered the application. And I am delighted to announce that we have today granted permission to the people of Ulva to bring their island into community ownership. Scotland’s islands and rural communities attract visitors from across the globe. The tourist boom that our country is enjoying is great news. It means more jobs and investment. But it can also mean pressure on transport, services and facilities – especially in rural areas. The Scottish Government is determined to help. So I am pleased to announce today that we will establish a new £6 million Rural Tourism Infrastructure Fund. It will take bids from communities and work with local councils. And it will allow even more people to enjoy this, the most beautiful country in the world. Giving every child the best start, with the opportunity to live a healthy life, with a great education, and in a clean environment is at the heart of our programme for a new Scotland. But today’s generation faces another defining challenge. It is one that is rocking the foundations of political establishments across the democratic world. It is the challenge of our age – tackling the unfairness and inequality felt so sharply by so many. Here in the UK inequality is among the worst in the developed world. We intend to drive change here too. The fact that real wages have stagnated or fallen heightens the sense of unfairness. So to our nurses, teachers, police officers, firefighters – to all of our dedicated public sector workers – let me reiterate this commitment today. Next year, we will seek pay deals that are affordable but also fair. The 1% pay cap will be lifted. We are the only government in the UK to make this unequivocal commitment. It is now time for others to do so too. Making decisions that tackle the big challenges is the responsibility of our government. Last year, this conference asked us to investigate the feasibility of a citizens’ basic income. So we’ve announced the funding to do just that. You asked us to tackle period poverty. So we set up a pilot scheme to help low income women. And last month we announced free sanitary products for all in our schools, colleges and universities. I can announce today that this groundbreaking commitment to tackle the gender injustice of period poverty will be delivered from the start of the new academic year next August. Scotland and the SNP – once again – leading the way in building a better, fairer country for all. Of course, a fair society must be paid for. Decisions taken at Westminster still determine our overall spending power. Revenue from income tax makes up just one third of our budget. But the prospect of more Tory austerity and the impact of Brexit pose growing threats to our public services and the most vulnerable in our society. That means it is right to consider how our limited tax powers might help us protect what we value most. As we do so, this question will be centre stage. Too often, the debate on tax is framed as the economy versus public services. Our taxes pay for the support that our businesses need to thrive just as they do for our health service and our schools. And our competitiveness as a country is about more than just our tax rates. It depends on the strength of our public services, the skills of our people and the quality of our infrastructure. It is a fact that a good society needs a strong economy. But let’s never forget this. No economy will reach its full potential without a strong, fair, inclusive society. And that’s what our government will always work to protect. The Tories often accuse the last Labour government of bankrupting the UK. I’ll leave Labour to answer for itself. But there is no doubt about this. There is a bankruptcy at the heart of this Tory Government. It is a moral one. The misery being caused to so many by the shambles that is Universal Credit. Treatment of disabled people so appalling that the UN brands it a human catastrophe. And all the while tax cuts handed to those who earn the most. For the sake of decency, austerity must end – and it must end now. We stand for a Scotland that is fair at home. And we want our country to play its part in building a better, fairer world. There is now a battle of ideas underway across the globe. A battle between those who want to turn inwards and those determined to look outwards. We know what side we are on. Our party is internationalist to its core and it will always be so. We’ve opened our doors and our hearts to refugees from Syria. We are working with the United Nations to support women in conflict resolution. In Africa and Pakistan we’re helping fight poverty and give girls the chance to be educated. We’re sending aid to Rohingya muslims fleeing violence in Burma. And our ground-breaking Climate Justice Fund is helping provide clean water in Malawi and irrigation in Zambia. We will never accept that a limit should be placed on the contribution Scotland can make to building a better world. Strong voices for peace and justice are needed now more than ever. Last week, ICAN, the global campaign against nuclear weapons won the Nobel Peace Prize. Our party stands proudly as part of the global movement for peace. So let us restate this today. No ifs, no buts from the SNP. We say no to weapons of mass destruction. We say no to nuclear weapons on the River Clyde, or anywhere else. Sometimes we underestimate the goodwill the rest of the world has towards Scotland. Last week, I visited Dublin to promote Scottish business. The warmth of feeling in Ireland towards Scotland is tangible – as is their frustration and utter bewilderment at the direction of the UK. While I was there, I met with the new Taoiseach and I am delighted that he accepted my invitation to visit Scotland next year. We look forward to welcoming him as we strengthen the ties between our two countries. The UK Government may want to retreat from Europe. We intend to stay at its heart. 15 months on from the Brexit vote, the Tories’ failure to guarantee the rights of EU citizens to stay here shames them. We don’t have the power to guarantee these rights ourselves. I wish that we did. But we will act where we can. The Tories want to make EU citizens apply for the right to stay and pay for the privilege. But if a fee is imposed, I can confirm today that – as a minimum – the Scottish Government will meet the cost for EU nationals working in our public services. It is a move that will give practical assistance to individuals. It will help us keep the doctors, nurses and other public sector workers that we rely on. And it will send a clear message to our fellow EU citizens, in actions not just words, that we welcome you, we value you and we want you to stay. Immigration is not an easy subject for politicians. But we have a duty to be straight with people. If we accept the Tories’ arbitrary target the number of people working and paying taxes here will fall. That means fewer people to generate the tax revenues we need to pay for our public services and support our older citizens. An immigration policy designed to appease UKIP must go. A Scottish policy that meets Scotland’s needs and lives up to Scotland’s values must take its place. It is time to give control of immigration policy to our own Scottish Parliament. And put ourselves in the driving seat of decisions that really matter. In so many ways, the chaos unfolding at Westminster threatens Scotland’s best interests. Labour’s position is as clear as mud. For the Tories, the Prime Minister has lost control. The hard-liners are running amok. They loathe the European Union. And they don’t much like devolution either. The EU Withdrawal Bill gives Westminster control over Scottish agriculture, fishing, the environment, GM crops, fracking licensing and a whole host of other devolved powers. It is a blatant power grab. We will not allow a Tory government to undermine devolution. Our message to the Westminster Tories is clear. We do want Scotland to stay at the heart of Europe. But that does not mean we think the EU is perfect. Sometimes it fails to live up to its founding values of human dignity, freedom, democracy and equality. When the people of Catalonia – EU citizens – were violently attacked by police just for trying to vote, the EU should have spoken up, loudly, to condemn it. In Catalonia, I hope dialogue will replace confrontation. It is time for the Spanish government to sit down with the government of Catalonia. It is time for them to talk and to find a way forward. A way forward that respects the rule of law, yes. But a way forward that also respects democracy and the right of the people of Catalonia to determine their own future. Choosing your own future. Being in charge of the decisions that shape your destiny. Being in the driving seat and not simply at the mercy of events. That is the essence of independence. And we are the party of independence. The case for independence doesn’t depend on Brexit. But Brexit does show us what can happen when we don’t control our own future. Over the years, there have been many decisions taken at Westminster that I disagree with. But in the course of my lifetime, there have been three defining moments when a decision taken there has changed fundamentally our country’s path. In all three, Scotland’s interests have been cast aside. In the 1970s, when oil was discovered in the North Sea Westminster had a decision to make – set up an oil fund or not. They chose not to. Independent Norway took a different decision. Last month, their oil fund topped one trillion dollars. One trillion reminders that taking your own decisions is better than letting others take them for you. After the financial crash, Westminster was faced with another choice. Stimulate the economy or impose austerity. The result has been a £3 billion cut to Scotland’s budget, the dismantling of the welfare state and thousands more children growing up in poverty. And now, Westminster is pursuing the hardest possible Brexit, knowing that it will make us all poorer. Just think if those decisions had been taken in Scotland. The difference could be dramatic. The security of a multi-billion pound oil fund. And a country at the heart of Europe. When we think about those wasted opportunities, it should make us all the more determined that, in future, we will do things differently. It should make us determined to put Scotland’s future in Scotland’s hands. As I have always said, Scotland should have the right to choose our future when the terms of Brexit are clear. We have a mandate to give the people that choice. That mandate was won fairly and squarely. But exercising it must be done with the interests of all of Scotland at heart. People want clarity about Brexit first. But to all of you here in this hall and across our country who are impatient for change, let me say this. We may not yet know exactly when the choice will be made. But we can, we must, and we will always make the case for independence. With the UK government so engulfed in chaos and taking the country down a path of self imposed decline, the need to do so has never been greater. So let us make our case with conviction. Let us address concerns head on. And above all, let us inspire confidence in our fellow citizens that the way things are now is not the way they must always be. There is a better future to be had for all of us, if we chose to build it, together. The gap between Scotland’s interests and Westminster’s priorities has never been wider. The House of Commons is polarised. There are deep divides not just between parties but within them. 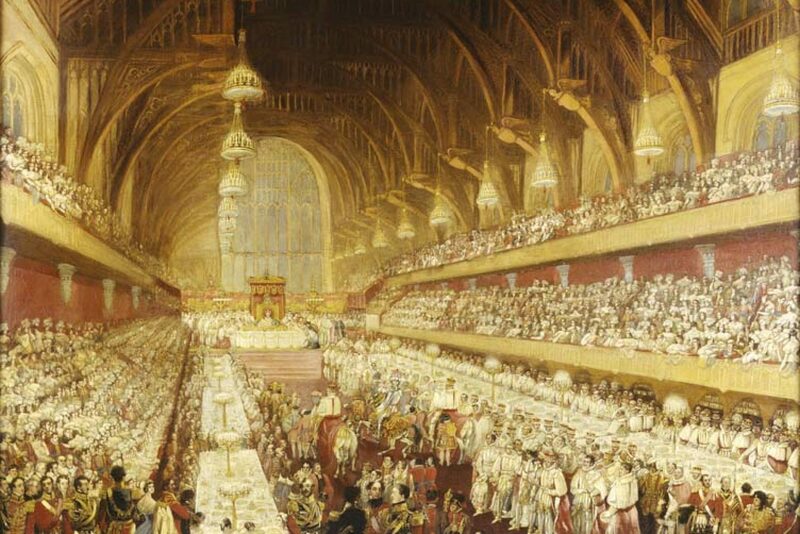 Politicians tipped to be future Prime Ministers hark back to Agincourt and Waterloo. They look to the past and the days of empire. We must look to the future. In an age of rapid global change we cannot afford to be bystanders. That means speaking up for universal democratic rights. And, yes, it means campaigning for independence. But it also means acting and governing today. Taking action now so that everyone has a stake in Scotland’s success. Providing opportunity and security for our young people. Caring for the elderly and those in need. Building a sustainable, green economy to create jobs and place Scotland at the cutting edge of technology. Our focus must be on what really matters – building a better Scotland and contributing to a better world. That has never been so vital. This is the time to believe in and work for that better future. To put ourselves firmly in the driving seat of our own destiny. That is what the people of Scotland deserve. That is what we will deliver.